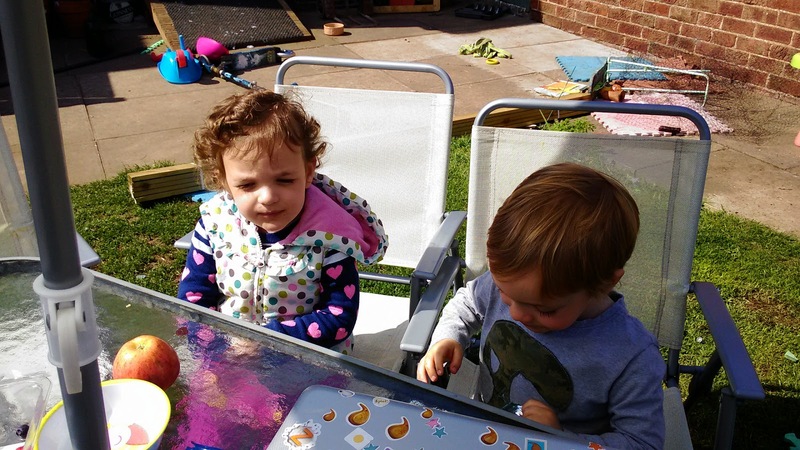 Monday was a lovely day so after I collected the twins from nursery we all sat outside enjoying the sunshine. I even managed to do a bit of blogging in the sun while they were busy playing! Guess what Taylor did at nursery on Tuesday! 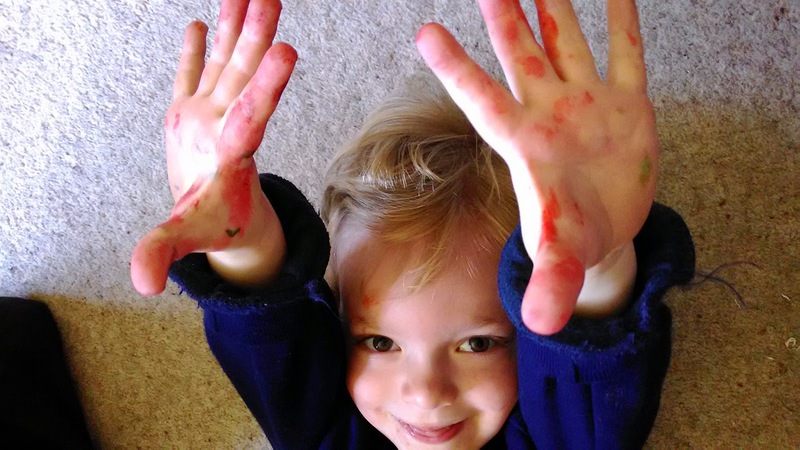 He came home with his hands covered in paint. He was so animated in the way he told me that he had been using red and orange paint. Isabella found it funny to tell their teacher that Taylor had forgotten to wash his hands. Their teacher said that she even put her hand over her mouth and giggled as she said it! I love school pick up time. On our walk home it is lovely how they both excitedly tell me what they have done during their morning at school. Walking the puppies of anarchy (as we call them!) has become a much loved part of my morning routine. After I have dropped the twins off at school I have a lovely walk home then take the pups straight out. We enjoy a walk around the fields next to our house. We often have the cat joining us too when she is out she will follow us all of the way. On Thursday I harvested our first crop of the year! 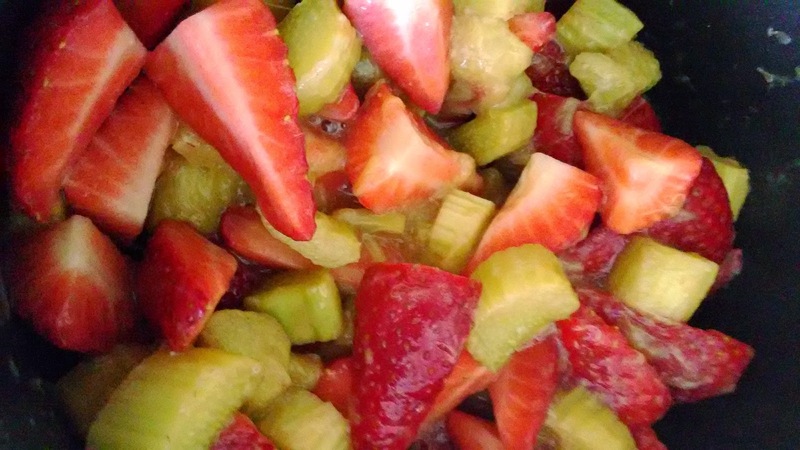 Our rhubarb has been shooting up so it was lovely to go down the garden and pick some fresh fruit for a delicious rhubarb and strawberry crumble! As the puppies are getting older, they are now 18 weeks old, they are starting to calm down a bit, which is lovely, especially for the children. 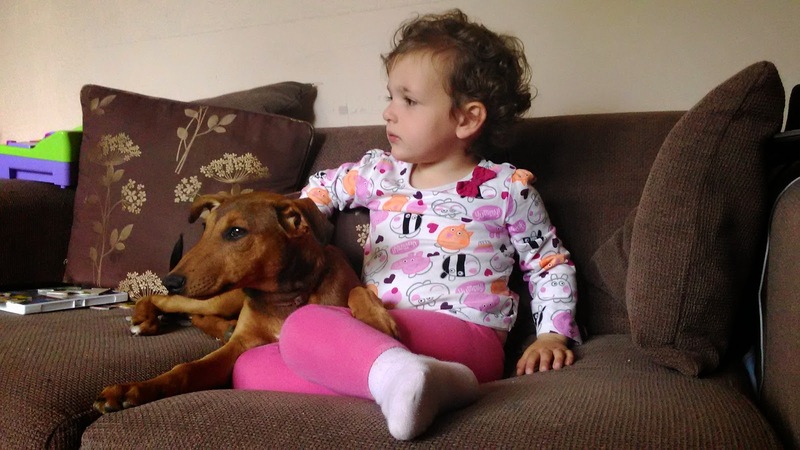 We have started to let them come into the lounge a lot more now and on Friday afternoon Jax went up and snuggled up with Isabella. This picture really does make me smile as it shows that the puppies are well and truly part of the family. 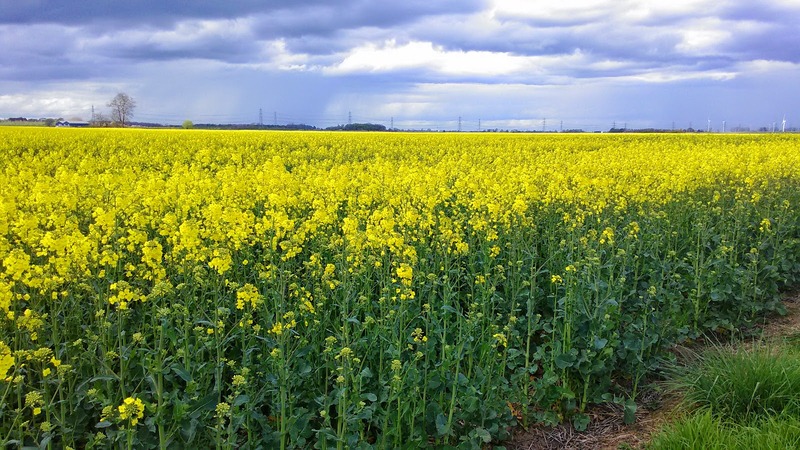 The fields next to our house are now full of yellow flowers. It is such a lovely sight and when I look out onto this view I really do appreciate how lucky we are to live where we do. Yes we are out in the sticks, we do not have a local shop, there is not a lot to do but we love it. I love that the children are growing up in this environment and I love the peace and quiet! Those sticky hands :-D ...That is one happy child! 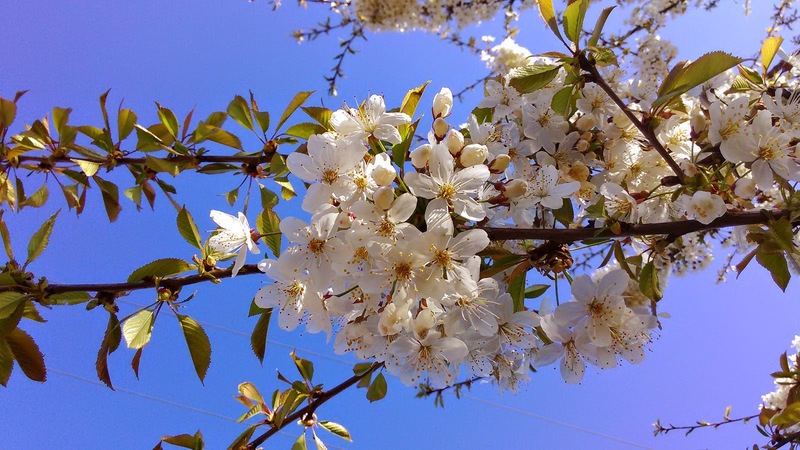 Love the blossom too, hurrah for gorgeous SUNNY spring days. I'm glad nursery is going well. It looks like you have made the most of the nice weather this week too. Your puppies look so cute! They must keep you very busy! It is great how the puppies are fitting into the family, they will be well loved. Love the titles the puppies of anarchy......makes me think of our gruesome twosome title. What a great field of yellow flowers you have captured it marvellously, I am like you I love where I live. Rhubarb and strawberry sounds a great combination, will need to try it. It sounds like the twins really enjoy their time at nursery. 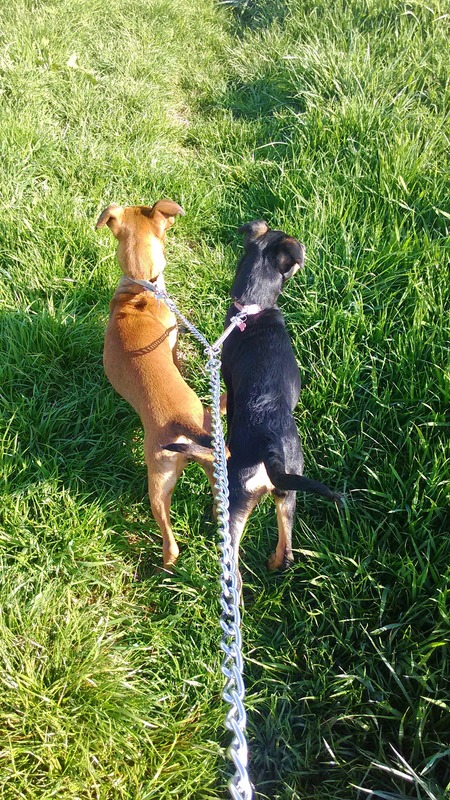 i have never seen a two dog lead before!